Despite being a geezer, by late August I am usually deep into my annual marathon training program. But a fractured foot six weeks ago has left me humbled in the basement, logging hours on a stationary bike until I can return to ground pounding. 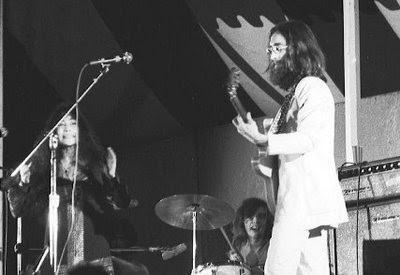 Tonight, I scheduled a 30-minute bike session and grabbed my headphones, CD player, and The Plastic Ono Band’s Live Peace in Toronto 1969. I had this album soon after it was released, when I was in high school, but despite my Cream fixation and the album’s inclusion of Eric Clapton on guitar, I never made it all the way through both sides once I encountered the dreaded and legendarily-unlistenable Yoko cuts. Damn straight - make mine the audiophile version! But as I got underway, I felt the taunting of that young Japanese woman all those decades ago. The decision was boldly made: my 30-minute ride just got expanded to 39 minutes. Maybe it’s the years I logged in training with unconventional female singers like Nina Hagen and Lydia Lunch, but each atonal bleat uttered by Yoko only made me pedal harder and faster. I refused to lose! Mercifully, it came to an end with me drenched in sweat upon hearing the final utterance of, “Give peace a chance…” But I was triumphant! I heard every second, every note - and, since I’d masochistically purchased the Mobile Fidelity Sound Lab Ultradisc II gold disc version of this release, I heard it in the best possible sound quality! This is a wonderfully written story.